In 2001, herbicide use began to increase in Finland largely due to government policies subsidizing growers to no longer plow fields for weed control. Finland is a signatory to the North Sea Treaty which includes a goal of reducing nutrients into the North Sea by half. Research showed that a considerable amount of phosphorus moves into waterways with eroded soils from fields that are plowed in the autumn. Thus, growers now are using herbicides to control weeds without plowing in order to keep phosphorus out of the North Sea. “Our weed survey represented part of a follow-up project on the impacts of agri-environment policy in Finland. For instance, reduced tillage has been one of the subsidized measures primarily implemented to reduce nutrient leaching. Spring cereals, 1.1 million hectares in total, covering 50-55% of arable land, dominate crop production in Finland. In the 1990s ploughing was still the standard tillage practice in spring cereal fields, while the latest statistics show that only approximately half of the cultivated cereal field area is currently ploughed. Ploughing has been replaced with reduced tillage methods (29%) or direct drilling (17%). 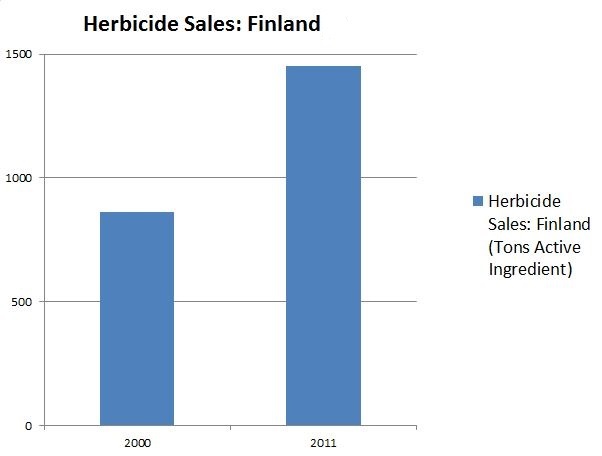 At the same time, the sales of glyphosate have more than doubled within a decade in Finland. Author(s): Salonen, J., et al. Title: Impact of changed cropping practices on weed occurrence in spring cereals in Finland – a comparison of surveys in 1997-1999 and 2007-2009. Source: Weed Research. 53:110-120. 2012. This entry was posted in Herbicides and tagged fungicides, Herbicides, insecticides, Organic, pesticides, rice, U.S., UK, US, weeds, wheat by pesticide guy. Bookmark the permalink.